Susan Cinoman, Director of Theater Operations, is taking a step back from directing this year’s fall play. For the first time in Woodland history, the fall play is going to be directed by the students, with senior, Jennifer Guluzy, at the head of the crew. The idea was shared to the rest of the Drama Club; however, no one stepped up to the plate to take on the major role. Guluzy took the position to make sure everyone could have a chance to do a play and a musical this year. “There wasn’t really a selection process, and it was more of stepping up to the plate because no one else wanted to,” Guluzy shared. She has always been interested in directing, and was thrilled when this opportunity came up. Guluzy has worked as the Productions Manager for Woodland’s previous productions of “The Wizard of Oz” and “Treasure Island”, meaning she worked alongside the director. Production managers are responsible for the technical management and supervision, so Guluzy helped the director make sure everything was in order and they were on schedule. She picked up the basics of directing, and hopes to put what she has learned to good use. “This is my first time officially directing a mainstage show. I directed the Thespian induction and performance collective, and I’m helping with the direction of the coming winter music show,” Guluzy said. Since her sophomore year, Guluzy has taken on leadership roles in theatre, and the director position seems like another step in the right direction. She is ready for the new experience, despite it being a difficult task to take on. As it is Guluzy’s first time directing, she is anxious to see how it turns out. Along with the pressure of impressing the student body, there is also the pressure of impressing the judges at the Halo Awards. The Halo Awards is a statewide award show for high school theatres that recognizes the talent of Connecticut. Woodland has taken home several Halo Awards, and this year the pressure is on. Guluzy is well rounded in the Drama world, having been apart of Woodland’s club since freshman year. Entering her fourth year, Guluzy has taken a strong liking in theatre and productions. She states that it is her life now, and along with Drama Club, she also does work with the Naugatuck Teen Theatre. She has wanted to always do theatre in her life, and she wishes to go down the path of teaching theatre in the future, in order to spread the love for the arts for generations to come. In the meantime, Guluzy is incredibly proud to be the first student director. “It’s a title I never thought that I would have, but I have to say that I feel incredibly proud. I really hope that students see me taking this initiative and then try to direct shows too,” Guluzy stated. Guluzy hopes to be apart of a big change soon to come to Woodland. 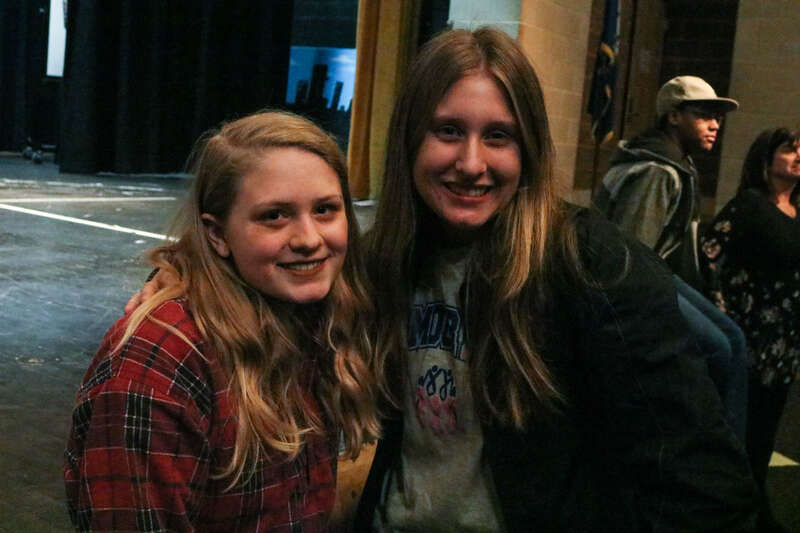 With the first student directed play, she hopes to inspire others to take on major leadership roles and help break down the stereotype that only teachers can direct plays. She sees this as opening a new door in Woodland history, and hopes to make a big impact before departing in the upcoming year. This year’s play, Snow Angel by David Lindsay-Abaire, is a bit easier and shorter than most, though it is not an official one act show. The students who are in it are working very hard and are very dedicated. Despite having a student director, the students are accomplishing a lot in a short amount of time. Guluzy says that she and the crew are bonding really well. She has worked with a lot of the cast before and some are even her closest friends. Her partner in crime, Mary Lippa, is the stage manager. Despite working well with the students, there is a different atmosphere with a student director rather than a teacher director. Most of the cast and crew take Guluzy seriously, however the biggest challenge of student directing is drawing the line between thinking of her as a peer and thinking of her as someone in charge that they need to listen to and respect. It is a very different climate to have a teacher directing rather than a student. With a teacher, there isn’t that line between peer and leader. Teachers are the authoritative figure, and this is something Guluzy has had to learn how to become. In her mind, this is the biggest challenge for the show. The group makes it easier for Guluzy because they are all nice and understanding, and most importantly, cooperative. Unfortunately, the club will not be able to put on the winter play this year. According to Guluzy, the leadership role was handed to her way too late for a proper production to be put on. The pressure was on, with only a month and a half to organize an entire show with a set and all. “We would have to build a set in a month and get all of that sorted out which was just not realistic,” Guluzy shared. The set of the show is the arrangement of scenery and properties to represent the place where a play or movie is enacted. Without a set, the play would have no meaning. There was no time in the one month of rehearsals for the crew to put together a set. Despite the failure of the winter production, that will not stop Woodland’s Drama Club. The students are planning to put in 110% effort into their spring production. Guluzy is bummed about the lack of winter show, but she is excited to move forward. She continues to hope that students take inspiration from her and take up strong leadership roles. Even though the show could not go through, Guluzy did learn a lot and hopes to go on and pursue something in the arts industry. edited 1/26/2018 3:42 EST – Correction made about – Guluzy obtained it, not Cinoman.